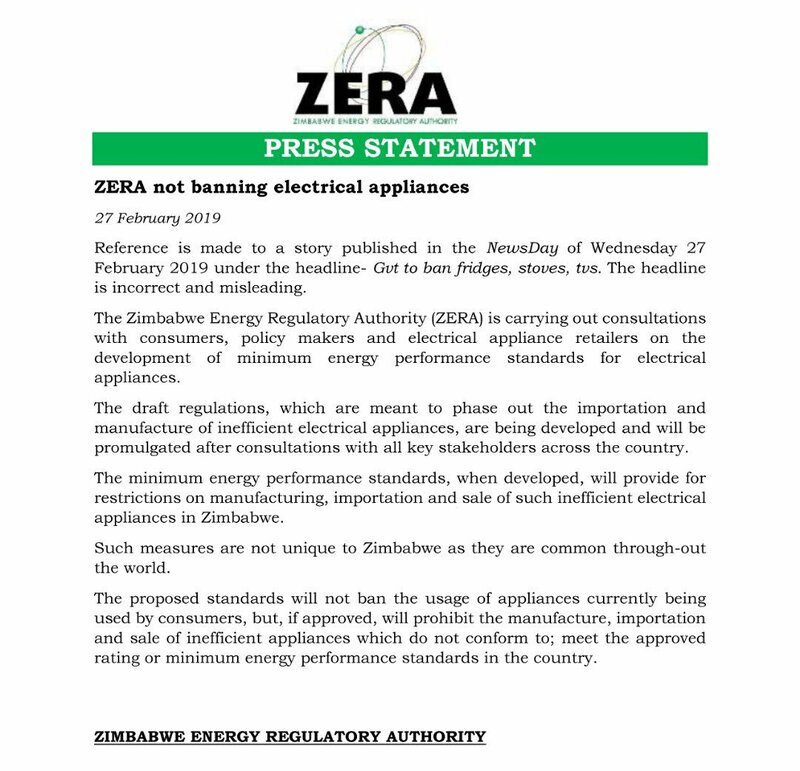 The Zimbabwe Energy Regulatory Authority (ZERA) has categorically denied reports in Wednesday’s Newsday that it is mulling plans to ban the use of several electrical gadgets to save 300MW of power. Reference is made to a story published in the Newsday of Wednesday 27 February 2019 under the headline- Gvt to ban fridges, stoves, TVs. The headline is incorrect and misleading. The Zimbabwe Energy Regulatory Authority (ZERA) is carrying out consultations with consumers, policymakers and electrical appliance retailers on the development of minimum energy performance standards for electrical appliances. The draft regulations, which are meant to phase out the importation and manufacture of inefficient electrical appliances, are being developed and will be promulgated after consultations with all key stakeholders across the country. The minimum energy performance standards, when developed, will provide for restrictions on manufacturing, importation and sale of such inefficient electrical appliances in Zimbabwe. Such measures are not unique to Zimbabwe as they are common throughout the world. The proposed standards will not ban the usage of appliances currently being used by consumers, but, if approved, will prohibit the manufacture, importation and sale of inefficient appliances which do not conform to; meet the approved rating or minimum energy performance standards in the country.